Put the peel in a bowl and mix in two cups boiling water. Let sit for a couple of minutes, till you can really smell the orange and can comfortably put your fingers in the water to twist the oils out of the peels. Twist the pieces to extrude as much oil from the rinds as possible. Remove rinds and set one piece aside. Add a couple drops of Olive Oil. Add in the rags and let them soak a couple of minutes. Remove and wring cloths thoroughly-removing as much moisture as possible. Fold in thirds and roll up into what should look like a finger towel and is a size that will fit easily through the mouth of your jar. 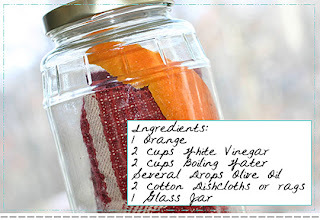 Add a piece of the orange rind to the jar for fragrance and store for up to a week. You can also use the towels immediately after wringing without storing, but the orange essence won't be as strong and pleasant. Thanks for the comment Carrie from bloomacious. This is her recipe and she wanted to let me know that these wipes are for wood veneer furniture not for heavy duty cloroxy type jobs. Good to know! click HERE to go to bloomacious. I apologize for not posting a link. Such a cute site BTW. Hey Andy - thanks for posting my recipe! We'd love it if you would include a link to www.bloomacious.com with my photo - also thought I'd mention that these wipes are for furniture (wood veneer) not so much for heavy, cloroxy type jobs.